Browse and view our recorded webinars and video tutorials. Let our experienced engineers take you through everything you need to know about Open-E DSS V7 and our previous releases. You will find out how to implement, configure and use the key features of our software - all with lots of practical solutions and tips. Take your pick and keep your technical knowledge up-to-date. Creating your RAID Array for the Open-E DSS V6 Volumes, Fibre Channel, iSCSI and NAS Logical Volumes and Fibre Channel, iSCSI Targets and NAS Shares for use. 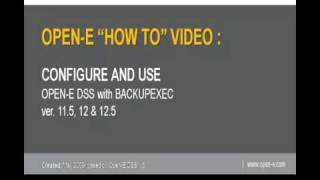 Learn from this video how you can configure and use Open-E DSS V5 with BackupExec. Showing 136 - 138 out of total 138 elements.